Now that I’ve gotten that out of the way, let’s turn our attention to all the things that need to be done before your adorable children head back to school. Buy too many school supplies. Clean rooms to find socks and toothbrushes. Forage in closets for salvageable back-to-school items. Grumble about the cost of new shoes. Hail the benefits of hand-me-downs. Invest in an expensive lunch box set that will be used exactly ONE time. Jump for joy (when the kids aren’t around). Kiss your homework-free evenings goodbye. Lament the end of summer by eating an entire peach pie. Negotiate a peace treaty between your daughters. Ogle the beautiful fall fashions, and wish you could get some back-to-school outfits for yourself. Prepare for the deluge of permission slips, disclaimers, waivers, applications, donation requests and registration forms. Quietly discard the hundreds of water guns in your home. Relocate the jars of snails, caterpillars, potato bugs and ladybugs your kids have collected over the summer. Secure a home equity loan to pay for school and activity fees. Throw a Back-to-School family dinner. Unveil the new job chart for the year. Vocalize concern about your daughter’s back-to-school eyebrow piercing. 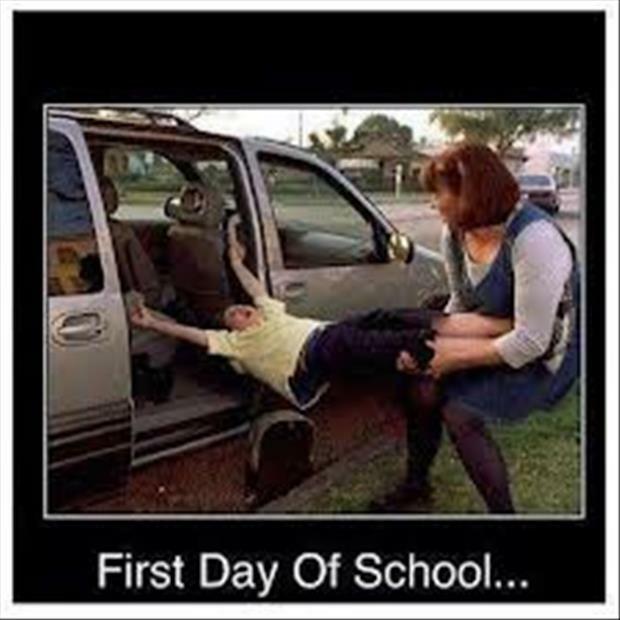 Weep as your kindergartner, new junior high student and/or high school senior goes to school. X-axis fear sets in as you realize you have a child taking geometry. Yawn and decided you’ll tackle everything tomorrow.